Remember that big project I've been kind of talking about for a long time here, but couldn't tell you any details? WELL. I've been finally given the go-ahead to let you all know, and let me tell you I'm SO excited about it. 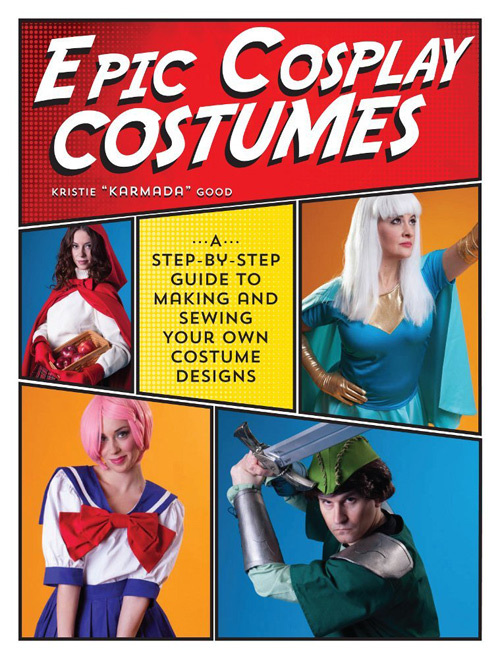 And not just any book - I wrote a book about COSPLAY. Coming to Shelves this SEPTEMBER 2016! You can preorder it currently on AMAZON! A lot of people are curious about cosplay and want to start making their own, but are intimidated or don't even know where to start. If you are one of these people, then this book is for you! If you're a veteran cosplayer and would like a reference guide on how to make costume pieces on the fly (I mean, come on, none of us have ever been making our costumes the night before the convention, right? *large exaggerated wink*), this book is also for you! Are you a parent/adult who can sew, but your child/relative wants a cosplay costume and you're not quite sure what you're getting into? Then this book is for you as well! I designed this book to fit a whole host of cosplayer types, so it can be helpful to both the new and veteran cosplayers. Costumes don't have to be complicated - and that's what I'm here to help you with! There's a ton of information stuffed into this book (as much as the publisher would let me) - all the patterns/tutorials in this book are also designed to be altered, changed, and shaped by the reader! Each project is a simple design that can be altered to create a whole host of various types of costumes - so I encourage my readers to GET CREATIVE! I plan to do some further posts about this book (I did a ton of work on it - as I am not only the writer, but I also illustrated the entire book - illustrations and how-to diagrams included - and created all the sample garments you'll see inside! ), but I wanted to get the word out to you now.